For me, identifying the species of the animal I photographed is an integral part of nature photography. But sometimes, none of the displayed images in field guides match the creature you just found. This brings me to the topic of today's educational blog entry: Color Morphs in Damselflies. In many species of damselflies, females can be found in various color variations (morphs). However, in most field guides, only the most common color morph is displayed. One of the most impressive color variation is the androchrome morph. Androchrome females mimic males by displaying a male coloration. Female damselflies that show the female specific coloration are called gynochrome, respectively. I will try to exemplify this topic using the Emerald Damselfly (Lestes sponsa). Lestes sponsa males have a blue/green metallic coloration with blue eyes, whereas females usually are bronze/copper with brown eyes. The male abdomen ends with a clasper organ (cerci), used to grap the female neck during mating, whereas the female abdomen is characterized by an ovipositor, used to lay eggs. The image below shows a tandem of a male (top) and a gynomorph female (bottom). Usually, the male keeps hold of the female even after the successful mating and egg deposition. The main purpose of this behavior is to prevent the female from mating with other males. A tandem of a male (top) and a gynochrome female (bottom) Lestes sponsa. I took this image in the early morning (hence the dew drops), mating and oviposition (egg laying) probably happened the day before. Note that the female shows the typical blue coloration, whereas the female is colored in copper. The Emerald Damselfly (Lestes sponsa) is usually a species easy to identify. 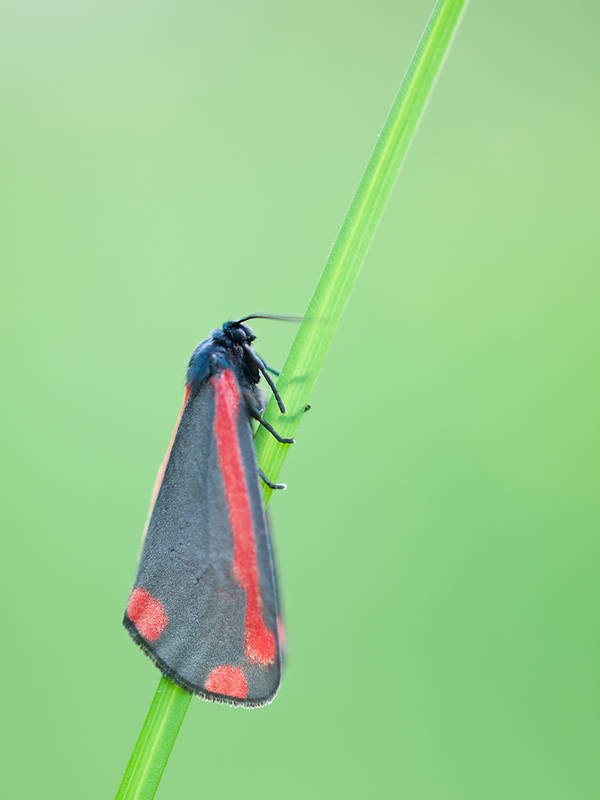 Its typical wing position while resting easily denotes them as Lestidae (spreadwings). However, one early morning I found a spreadwing I could not correctly identify at first. The shape of the abdomen clearly told me that it is a female (the ovipositor was clearly visible), but its body coloration as well as its eyes were blue (see image below). However, in my damselfly field guide books there were no spreadwing species with blue females. Blue colored female Lestes sponsa (=androchrome female). Only later I discovered that I had found an androchrome female of Lestes sponsa. According to a scientific publication investigation a population in Sweden, 18,5% of the analyzed females showed an androchrome coloration. So, this color variation is not as rare as you might expect due to their almost complete absence in damselfly field guides. 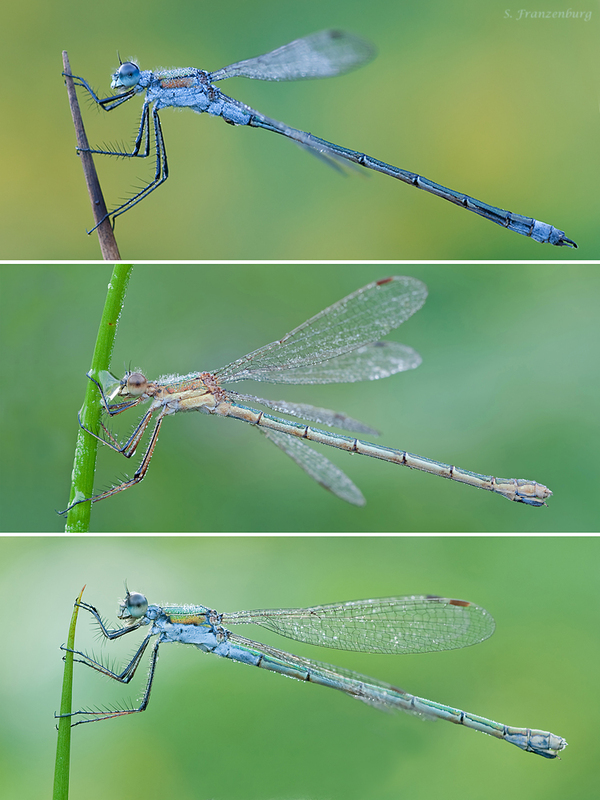 For comparison, the following collage shows a male (top), a typical female (gynochrome, center) and a male-mimicking female (androchrome, bottom) Lestes sponsa. top: typical, blue colored male. Note the slender abdomen and the cerci at the end. bottom: androchrome female, note the blue coloration of the body and eyes. So, why do some females mimic male coloration? One of the most prominent hypothesis considers "male harassment" as an important factor in the evolution of androchrome females. As you can imagine, being grabbed by a male damselfly by the neck and fly around as a tandem will negatively affect the females survivability; e.g. it is easy to assume, that predatory birds will be able to catch a damselfly tandem more easily than a single female. 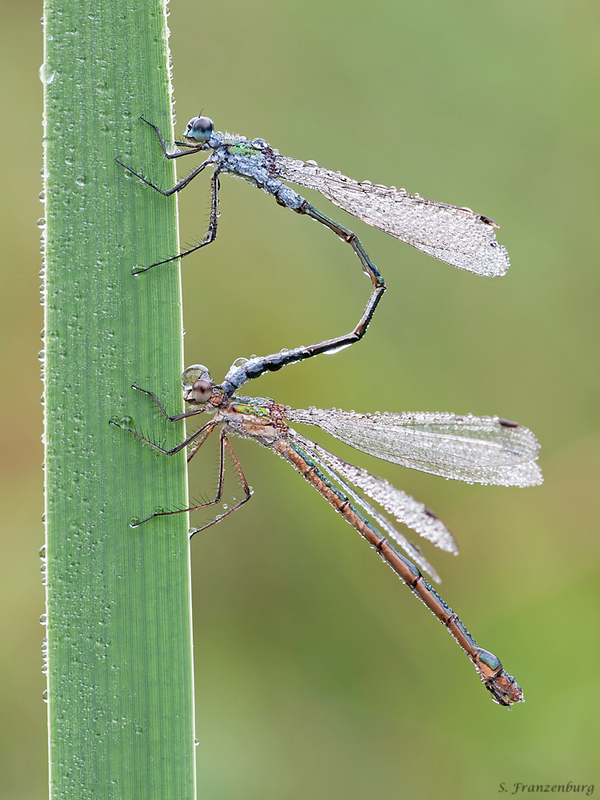 Indeed, several studies show that damselfly males prefer to mate with the normal colored females (gynochromes), whereas androchrome females where much less observed in tandems. Thus, androchrome females successfully avoid male harassment. On a downside, androchrome females also had a reduced fecundancy (as expected). However, if the population density of the investigated damselfly species was high, male harassment on gynochrome females increased to a level where fecundancy in androchromes was actually higher. In low population density, male harassment on gynochrome females was "acceptable", whereas many androchrome females where not mated and thus had no offspring. Under these circumstances, you would expect that the abundancy of androchrome females should drop in the next generation. But, under high population densities, gynochrome females suffer from the numerous mating attempts of males, decreasing their fecundancy below the fecundancy of the androchrome females. In these populations, you would expect to see more androchrome females in the next generation. Thus, it is hypothesized that the occurrence of androchrome females in damselfly is mediated by a population-density dependent negative effect of male harassment on female fecundancy. An interesting evolutionary topic, that unfortunately is not intensively researched. 1. "A preliminary study on female-limited colour polymorphism in Lestes sponsa"; Outomuro D, Söderquist L, Rodriguez-Martinez S & Johansson F; International Journal of Odonatology 2014. Today's post is about my recommended camera settings for macro photography. For this purpose I have taken a screenshot of the so called "Super Control Panel" of my Olympus E-M5. This great menu shows all relevant settings, which can also be directly modified on this screen using the buttons, dials or the touchscreen. In macro photography, details matter. Thus, sensor noise should be avoided. Set your ISO to "base ISO" (most often this is ISO 100, in case of the E-M5 it is 200). Only increase the ISO if you need faster exposure times to avoid blurred images. According to the manufacturer, you should deactivate the IS if you shoot from a tripod, because the complete absence of movement apparently "confuses" the IS system. Not a big deal from my experience though. The auto WB does the job for me. If it misses the correct color temperature, you can always adjust it in the post processing using the RAW files. Meanwhile, I broke the cables of several remote controls for my camera, thus I mainly use the 2 seconds timer at the moment to avoid to blur the image due to my shaky hands touching the shutter release button. I combine the timer with the so-called "anti-shock" option of my camera (shown by the rhombus symbol next to the 2s timer). In mirrorless cameras, the shutter is open by default (to enable live view) and has to be closed first before a picture can be taken. The fast series of shutter closing, shutter opening and shutter closing again causes small vibrations, that can decrease the sharpness of your macro image when using a tripod. The anti-shock function causes a delay between the initial closing of the shutter and the actual shutter movement when taking an image. A similar function is the "mirror lockup" for DSLRs, reducing the vibration caused by the moving mirror. The AF is barely usable for macro photography. Manual focus (MF) is the way to go here. I highly recommend to use the RAW file format which allows to easily adjust White Balance , exposure, contrast etc without causing strong artifacts. I will explain that in more detail when I come to the post processing part of this macro guide. In addition, I save the JPGs in maximum quality, since these are really good in Olympus cameras, sometimes even better than what I can achieve with my RAW post-processing workflow. I usually put the exposure compensation to a positive value (e.g. +0,7 or even +1,0 as shown in the screenshot). First, I like my images with bright colors, second, the Olympus sensor is not great with rescuing details from dark shadows in the post-processing. Generally, I follow the rule of Expose to the Right. One of the most important creative tools for macro photography is the choice of the correct aperture. The smaller the aperture (= the bigger the f/ number), the bigger is the depth of field. The effect on the image is shown in the gallery below, showing images shot with different apertures. At the same time, closing the aperture increases the exposure time, because less light is reaching the sensor. What does this "aperture series" show us? The first image (f/2) was shot with the aperture wide open, causing an extremely shallow depth of field. Important parts of the insect (e.g. parts of the wing) are not in focus and the background shows a boring, monotonous green. The two following images (f/4 and f/5.6) look good to me. The relevant parts of the insect are in focus and the background got some structure caused by yellow flowers in the background. The image taken with f/5.6 has the edge here, because the background has bit more color variation. This effect is even stronger in the image taken with f/8, but here the details in the background start to compete with the motive for the viewers attention. In addition, with f/8 we reached exposure times that might be too long if there is a bit of wind. The image taken with f/11 already shows some a bit of "chaos" in the background, while the image with f/22 (minimum aperture of most lenses) shows a lot of details from the meadow and had an exposure time of 1.3 seconds, causing the slightest wind to blur your image. In addition, the sharpness of lenses decreases when the aperture is highly closed (keyword diffraction). In conclusion, the f/5.6 image is my favorite here, but I leave that open to personal preference. For beginners, it is certainly helpful to shoot the same scene with different apertures and select the best one at home after reviewing the images on a big screen. The depth of field is also dependent on the sensor size. The sensor of a full frame camera is 4x as big as the one of my Olympus camera (µFT). To achieve the same depth of field as with my camera, you have to stop down the aperture by 2 stops with a full frame camera. My favorite picture from above (f5.6) thus would correspond to a f/11 picture shot with a full frame camera. This can force you to increase the ISO to stay within an acceptable range of exposure times. Compact Cameras have the opposite problem. Their sensor is very small, leading to a big depth of field even with open apertures. Thus, images taken with compact cameras often struggle to create soft backgrounds (compare to the f/22 image shown above). In addition to the suitable equipment (see part 1 of my macro photography guide), a successful macro photography tour needs preparation. In the 2nd part of my workshop series I want to explain how I prepare for a photographic field trip. The cold: After reading part 1 of my macro photography guide, some readers might have wondered how to use a tripod, as recommended by me, and not chase away the motive. The answer is in the biology of the animals. Insects, spiders, amphibians and reptilians are poikilotherm, that is, their body temperature is determined by the environmental temperature. Thus, their motility is drastically diminished in the cold morning hours. You can easily approach a dragonfly in cold rigor up to few centimeters. One disadvantage of these practice is, that non-moving animals are much harder to spot than active ones. Our eyes are trained to see movements, thus, spotting quiescent animals needs some training. Further, many facets of animal behavior can't be photographed in the morning. Good news for late risers: The above mentioned benefits of early morning photography are also partially valid in the evening hours. The light: The early morning hours are the time with the softest light. In the first part of my guide, I already described the benefits of soft light when I explained the use of a "diffusor". Soft light is the key to detail rich images and vibrant colors. The evening hours are a good time for beautiful light as well. The wind: As already described in part one talking about "the plamp", calm air is one of the most important prerequisites for successful nature macro photography. The early morning hours are usually much more calm than the rest of the day. Dewdrops: Dewdrops can be a real eye-catcher in macro images, acting as tiny magnifying glasses. Dewdrops are usually found in the morning, caused by condensation due to the nightly temperature drop. The experience: I can tell you, the loneliness, the quiet and the slow awakening of nature in the early morning hours totally make up for the early rise. Just give it a try. Leptogaster cylindrica in early morning cold rigor and covered with dew drops. In the background you can see a dew covered spider web. Temperature: In my experience, morning temperatures < 15°C (=59° F) are necessary to reliably find insects in cold rigor. After warm summer nights, even at 4 am your motivs might already be active. Wind: The most important factor for my planning is the wind, which is really annoying here at the coast side of Germany. If it is windy, you can't focus properly or even compose your image, since your motive will move too much. An acceptable wind speed is for me < 15 km/h (< 10 miles/h). Less than 10 km/h I consider as perfect, which is a rare event where I live. Of course, you should combine the information from the weather forecast with a look out of the window, since the micro climate can be much different. Sun, Wind & Rain: Macro Photography in rainy weather is not fun, even with a weather sealed camera like my E-M5. Sunny or cloudy on the other hand is not that critical for me. A sunny morning enables more interesting lightning situations, while a cloudy morning gives you more time for photography, before the insects awake from their cold rigor. Google Weather screenshots: This day would be a potential candidate for a macro tour. One great thing about macro photography is that you basically can do it everywhere. Every small green spot is home to a variety of insects and spiders. For beginners, it doesn`t really matter if the motive is a common fly, a ladybug or a dragonfly. With growing experience however, you will want to find more specific motives. For example, for photography of dragonflies you will need to find a habitat near a freshwater source. For your initial search, you can use "google maps" to find water bodies, forests or meadows near your place. To really know a habitat and its photographic possibilities, you`ll need more time. If you know the habitat, e.g. which side of the pond is the sunny side in the morning or which plants grow when and where, your chances for photographic success are much higher, which brings me to the last point. The key to success is knowing the biology of the animal you want to find. For example, if I search for a specific dragonfly, I inform myself about the conditions a suitable habitat has to provide. For example, most species prefer stagnant water, but demoiselles (Calopterygidae) prefer streaming waters. If you search for a specific butterfly, I recommend to learn the feeding plants of their larvae. The Orange Tip (Anthocharis cardamines), one of my favorite butterflies, prefers to ovoposite on cuckooflowers or garlic mustard. So, if you find an area with a lot of these plants, chances are good to spot this butterfly species. Left: Orange Tip Butterfly on its feeding plant, the garlic mustard. Right: Banded Demoiselle, found in the reed of a small stream. So, that is my routine for preparing a macro tour. The most important preparation, however, is learned the hard way, that is that batteries should be charged and that the camera is a better place for your memory card that the slot in your computer at home. I want to share my experience in macro photography, so I decided to make a series of blog posts explaining my workflow. One thing in advance: The following guide is tailored to my photographic style, leading to the kind of images you can see in my "Portfolio" section. For example, I never use a flash and highly recommend the use of a tripod, whereas different areas of macrophotography highly benefit from a flash. Nevertheless, many points I will mention in this series are valid for general macro photography of all kinds. To start off, I want to show what kind of equipment I use, why I use it and what I like / dislike about it. I use the Olympus E-M5 as my current main camera. Although macro photography is quite undemanding with a camera, some features will make your life easier. First of all, you want to have an implementation of "live view", allowing you to magnify an area of your screen. This feature is a blessing when it comes to manual focussing (which I highly recommend for macro photography). Further, the E-M5 offers a tilt-screen. Since nature macro photography oftentimes happens at ground level, this is a feature I never want to miss again. All Olympus cameras have a µFT-sensor, having 1/4 of the size of a full frame sensor. While this has negative consequences for the image quality in terms of noise-performance in low light and dynamic range, a smaller sensor offers advantages for macro photographers. The µFT sensor is 17.3 mm wide, thus, with a 1:1 macro lens attached, you will be able to "fill" your whole image with a 17.3 mm long motive. As an example, the size of a house fly is 6 mm. Thus, at maximum magnification, the fly would occupy roughly 1/3 of your frame. In comparison, a full frame sensor has a sensor width of 36 mm. Thus, with the same 1:1 macro lens attached and at maximum magnification, the same fly would only cover 1/6 of your image width. In the praxis this does mean that you will have crop your macro images much more often if your camera has a bigger sensor (which you usually can do, because bigger sensors oftentimes offer more megapixels, but for me it is by far not as satisfying as capturing the high magnification image right away with a smaller sensor). Further, a smaller sensor offers an increased depth of field, allowing you to shoot at wider apertures compared to bigger sensor cameras and still get all the relevant parts in focus. This allows you to keep your exposure times short and even use the sweet spot of your lens in terms of sharpness and bokeh. But, sensor size discussions seem to be as fruitful as Canon vs. Nikon or Windows vs. Mac discussions, so I will stop at this point. In parallel to my µFT equipment, I use a full frame Sony A7 and I find the smaller sensor size to be beneficial for my kind of macro photography. When you are new to macro photography, you will quickly discover two frustrating things. Your depth of field will always be too small, preventing you from getting all the things in focus that you wanted to. Second, your shutter speed will always be too long (because you had to close the aperture to get more depth of field - a vicious circle), resulting in blurred images. A tripod helps with both problems. If you are searching for a suitable tripod, check how low to the ground you can get with it. The vast majority of your subjects will be below knee level. For my tripod, I actually modified it to remove the middle column, allowing me to spread its legs completely to get to ground level. My tripod is still a relict from my DSLR equipment, thus being really oversized for my current, small camera setup. The smaller size of mirrorless cameras would allow you to downscale other equipment parts such as the tripod and ball head. On a first note: All modern macro lenses are sufficiently sharp. I have used many lenses and I yet have to stumble across a bad macro lens from any manufacturer. However, there are some things that really help. First, the longer the focal length the easier it will be for you to position your tripod without chasing away your subject. Recently, Panasonic released a 30 mm macro lens for the µFT system, a focal length that I would consider useless for my kind of macrophotography. At maximum magnification, your subject will almost stick to the front lens and your lens will likely cast an annoying shadow on it. However, if you master such a lens, you might be able to get some unique perspectives into the macro world. Second, a tripod collar is a very valuable feature of a macro lens and I am very disappointed that many of the modern macro lenses don't offer this feature. A tripod collar allows you to rotate your camera (e.g. switching from portrait format to landscape format) without disturbing your focal plane. I will tell you why this is useful when I come to the techniques-part of this blog series. In my case, I primarily use a 25 year old manual legacy macro lens (OM zuiko 90mm f/2) with an adapter. For this adapter, Novoflex offers an accessory tripod collar. I really hope, Olympus will at some point extend their "pro" lineup by a 100 mm macro with a tripod collar. Sometimes your tripod doesn't get you as low as needed, or sometimes you just want to go low weight and leave your heavy tripod at home. In these cases, a beanbag comes in handy. It is easily self made and I like to use it for amphibian or plant photography at ground level. I suppose the name of this little helper comes from "clamp" and "plant", which is what I use it for in most cases. In macro photography, you deal with high magnifications and relatively long shutter speeds, making wind the macro photographers natural enemy. The Plamp, or a similar selfmade device, can help to stabilize your motive. Despite being mentioned in the shops description, I would not recommend to attach the plamp to your tripod, because that way you obviously can't move your tripod anymore to achieve slight changes in angles etc. Instead, I attach one end of the plamp to a knife which I then use as a peg to attach it to the ground. As mentioned above, I use a knife as a peg for the plamp. Scissors are useful to cut blades of grass that you don't want in your frame (note: think before you cut something in nature and obey the rules of nature reserves). Camera vibration is especially detrimental when you shoot at high magnifications. The slightest camera shake will significantly blur your image. Even the slight shock induced by the DSLR mirror or the shutter might lead to this effect. To prevent it, use a sturdy tripod, enable vibration-reducing functions in your camera (mirror lockup, "anti-shock" etc.) and use a remote control. If you don't own one, that can be replaced by the self-timer function (e.g. 2 seconds). These can be bought as collapsible all-in-one devices including a diffusor and multiple reflector covers in different colors. I use the diffusor quite often to soften the light. Since my main motives are insects and these have a highly reflective cuticle, direct sunlight on them will decrease the amount of details you can capture. In addition, by casting a diffused shade on your subject and leaving the background in sunlight, you will be able to create bright, vibrant background colors. If you want to do focus stacking (i.e. combining multiple images with different focal plains to one image), you will need a macro rail to move your camera without changing your frame and magnification. But also for normal macro photography, a macro rail is useful to precisely adjust your frame or focus. But I would rate it pretty low on the priority list. If you have any questions, just drop me a comment. Stay tuned. The next entry will describe the preparations for a successful macro tour. A few weeks ago, a friend of mine recommended to print my images on Forex Plates. So far, all my pictures were paper-prints that I framed to put on the walls. Now I gave it a try and ordered Forex Prints at Whitewall. This blog entry describes my initial impressions. I prefer to present my images in two different formats, 3:2 for landscape formats and 4:3 (the native sensor format of my µFT camera) for portrait formats. Thus, I chose to print my images with 24 x 16 inch and 24 x 18 inch, respectively. I would have loved to print even bigger, but I did not want to spend too much money for my first try. The ordering on the whitewall webpage was uncomplicated and a wide variety of sizes were avaiable. It took 9 days from ordering to delivery. The packaging of the images was the best I experienced with any print-service so far. The images seem to be better protected then some nuclear plants on this planet. Every image came in a single package, protected by a ~1 cm cardboard plate covered with a foam layer and wrapped in foil. So while your images are totally safe for transport, you have to deal with a big pile of cardboard waste afterwards. I think I would have preferred if both images were shipped in one package. After turning the images around, the slight annoyance about the big pile of cardboard was gone immediately due to the excellent quality of the Forex-print. The plates are light but seem to be sturdy and durable. The surface has a matte finish and the colors are brilliant. They have a little "soft" look which nicely fits the character of my images. One big advantage of the Forex-Prints is the light weight. The 24 x 18 inch print weights 380 g (13,4 oz) and thus can be mounted on the wall using two tiny nailes. In my new appartment the walls are extremely hard, so I am happy I do not need to drill holes in them. The images can be attached with help of two simple but efficient hangers at the backsite of the plate. Thus, the Forex print would be ideal for expositions due to its low weight and easy and residue-free mounting. Only the price is a high hurdle if you want to expose ~15 images on Forex. But it is a great choice for the lucky photographers whose exhibitions are financially supported by sponsors. Currently, I moved into a new appartment in Rostock. Thanks to the Forex Prints I now have some color on my previously white walls. Looking at them now, I would like them a little bigger, which would further increase the excellent impression of quality. Conclusions: I am very pleased with the results of my initial Forex try and will definitely order some more prints at whitewall. I highly recommend it to my photography friends. It's been a month since my last blogpost, my apologies. The long winter in the eastern US crossed my plans (see previous posts) and delayed the beginning of the "insect season". The first dragonflies are emerging now, but I have not enough material for a post about them, yet. Thus, I want to show a few images that I took on my way home from work. They might not be high quality, but I will show them anyways. First, have a look at this video I shot of this interesting creature (play in HD). Beavers are herbivores, they feed on shrubs, herbs and Waterplants. In addition, they cut down trees and eat their twigs, leaves and bark. This makes him a troublesome pest for forestry. A beaver can bring down a 50 cm thick tree in one night and thus cause enormous damage. To prevent damage, young trees are protected by netting wire, as you can see in the following two images. Tree protection. The red arrow marks a beaver swimming in the background. Interestingly, humans and beavers came to an agreement at Beebe-Lake. Every year, the trees near the walkway are trimmed. Instead of being shreddered, these branches are deposited next to the way. During the night, the beavers drag them in the water, which leaves visible traces in the gravel path. In the image below the beaver stopped his raid half way through. Although not all trees at Beebe-Lake are protected by wire, I could not find any fresh damage. It seems that the buffet deposited by the humans is sufficient for their needs and the beavers got lazy. A great example for effective beaver conservation efforts. It happened in the night from Friday to Saturday (April 4th / 5th). Mild temperatures around 6°C and light rain provided perfect conditions for the amphibian migration to their breeding ponds. There is a big golf course just behind my appartment with a small forest and vernal ponds in its center. Masses of salamanders used this night to crawl over the short green and thus were easy to spot. It was extremely dark, my flashlight ran out of power and I am a very bad videographer, nevertheless I want to show a short video to give you an impression of the scenery. 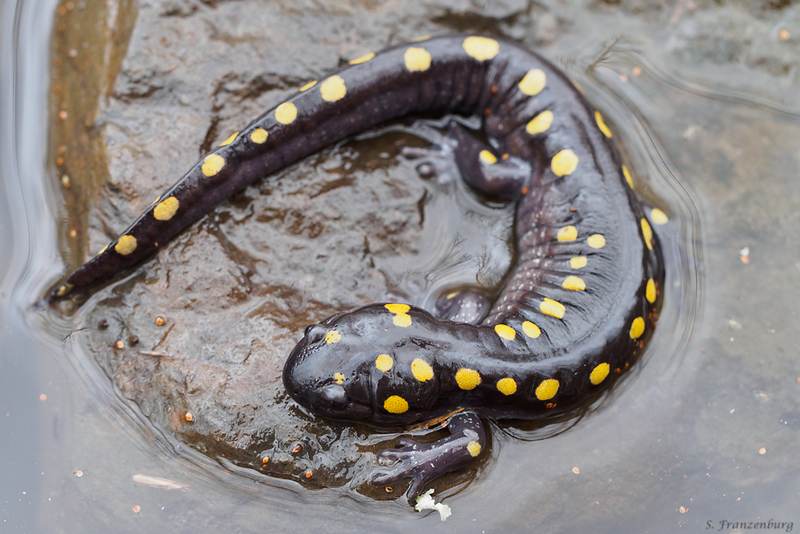 I could see the migrating dark-grey Jefferson Salamanders and the Yellow-Spotted Salamanders. I took two documentary images with use of my flashlight. Seeing hundrets of salamanders migrating was a spectacular scenery, but for photography the conditions were bad. Therefore, I went to the pond again next morning at st sunrise and I was able to spot a few remaining spotted salamanders. These animals are covered with a heavily reflecting mucus layer, so the use of a polarizer filter is recommended. Well, I learned that the hard way and ordered one now. Hopefully I get the chance to shoot these animals again and try to improve the results. Finally, I want to show a documentary dorsal view. In comparison to the european Fire Salamander, the spotted pattern ist drastically different and the yellow portion is much smaller. My original plan was to write the next blog post about the amphibian migration in Ithaca. Unfortunately, spring has not yet arrived here. Thus, I went to Taughannock Falls once again, together with my friends Daniel Zurek and David Duneau (Check out Daniel's nice video of the tour on Youtube). Meanwhile, masses of Canada Geese returned to Ithaca, waiting for the breeding season to start. Unfortunately, they will need to be patient. The following images should illustrate the frosty mood at Lake Beebe. With the Geese in the image, it gives a nice impression of the massive amount of ice that built up during the winter. Understandably, the geese were not very active this morning. I really admire their endurance. The following image was taken on March 27th at -14°C. Alright, the next post will hopefully show some amphibians. I still have hope for a wonderful spring here in Ithaca. This first Blog post on my new Website deals with the City of Ithaca (NY), where I am currently working as a postdoctoral biologist at the Cornell University. Ithaca is a small town with 30000 inhabitants, 20000 of which are Students at Cornell. Thus it can turn into a real ghosttown during the semester breaks. But Ithaca has a lot to offer for people who enjoy nature. The Cornell Campus includes two spectacular gorges (Fall Creek & Cascadilla Creek), which unfortunately got some questionable fame due to cases of suicide. Now, every bridge houses signs of the "crisis hotline", offering psychological help for suicide endangered students. Numerous waterfalls in these gorges offer spectacular views for nature lovers and photographers. 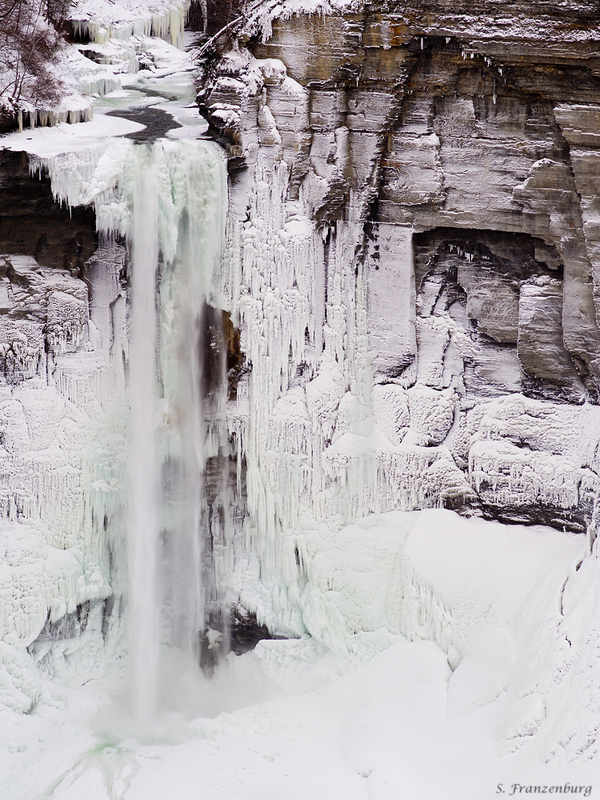 I want to use the currently heavy winter around here to show some images from these gorges. Temperatures between -10°C and -20°C for several weeks created amazing ice formations. On my daily way to work I pass the Triphammer Fall. These were artificially created by impounding the Beebe Lake and thus are not easy to photograph. For this image I used a telephoto lens to exclude anthropogenic elements from the image. Further downstream of Fall Creek are the Ithaca Falls, which serve as a semi-legal bathing place during the summer month. Since images of these Falls hardly visualize their size and light is always miserable there , I decided to take a self portrait in front of this gigantic wall of ice. The most famous waterfalls of the area are a 15 minutes drive out of Ithaca. The Taughannock Falls are higher than the Niagara Falls, but of course have a much smaller water flow. Photographic opportunities at this location are extremely limited. The falls are in the shadow the whole day and a nice viewing point is closed during the winter month. Additionally, you can find impressive ice structures at almost every corner. Despite all its beauty, I really hope that winter will release his grasp on us soon and make room for spring. I hope, you enjoyed my first blog post (ever). I wil try to update new content on a regular basis and I am happy to take critics and comments.